ActiveCampaign is a marketing automation tool and CRM. BigPicture.io will send events to ActiveCampaign and associate those events to a contact in ActiveCampaign. 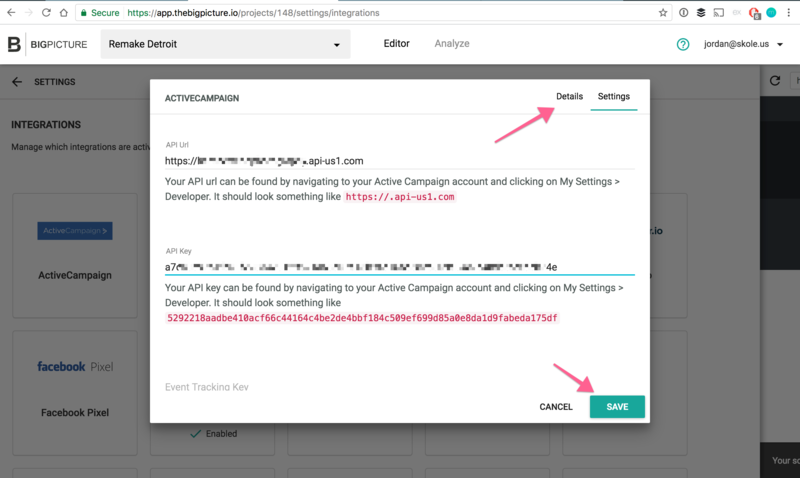 BigPicture.io will also automatically install the ActiveCampaign site tracking code. This will make it possible to trigger automations, achieve goals, segment contacts, fire conversions, whenever a contact takes a specific action on your website or inside your web application. IMPORTANT NOTE: ActiveCampaign is different from our other integrations. 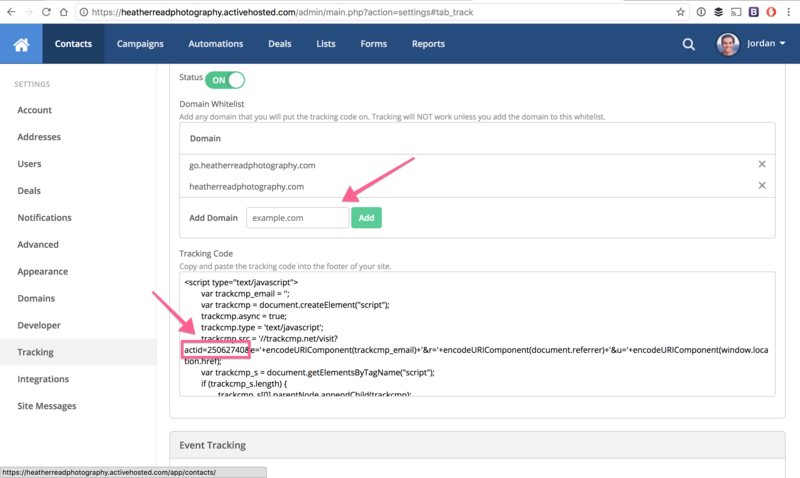 ActiveCampaign's API currently requires an email to be sent with every event in order to associate the event with a contact. This means we cannot send data to ActiveCampaign until an email is detected. You include an email input within a form on your site. Our system will automatically listen to when the form is submitted and parse the email from the form. You manually set the email using our script API. We also have a URL API (in beta), which will set the email from the URL. This is useful as you can include this as a link in your campaigns, then the email will be set when the contact clicks through to your site. Contact us for more info. Sending events to ActiveCampaign is easy. From your ActiveCampaign dashboard, navigate to the "Settings" page and select "Developer" from the left-side menu. Copy the API URL and the API Secret from that menu. Next, navigate to your BigPicture.io account. 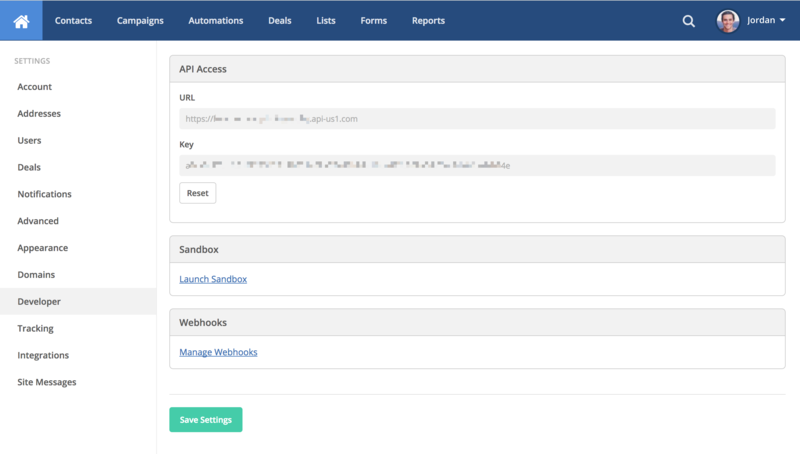 Click on the gear menu to view the settings menu, and click on Integrations --> ActiveCampaign. 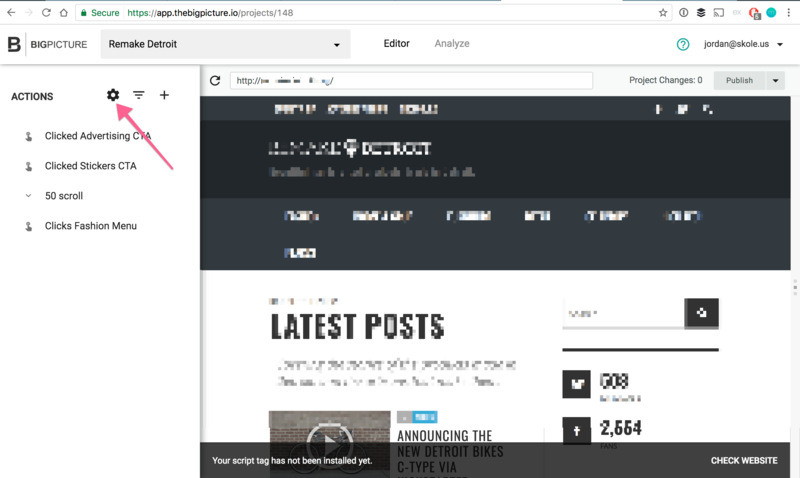 From the modal that appears switch to the "settings" tab, paste in your API URL and the API Secret you copied from your ActiveCampaign settings. Great! Now we need to add the Event Tracking Key, and the Account ID. Navigate back to your ActiveCampaign account, and click on the "Tracking" menu button from the Settings menu. Scroll down to the section that says "Event Tracking." 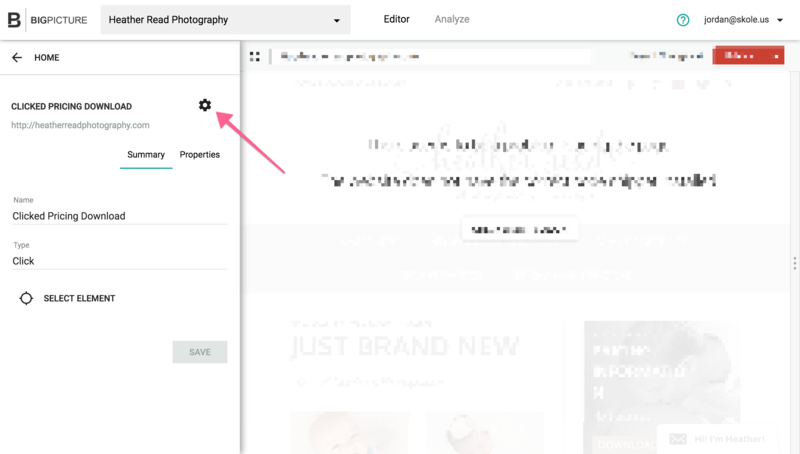 Copy the event key, and paste it in your BigPicture.io settings modal. The last step is to grab the ActiveCampaign Account ID to get ActiveCampaign site tracking setup. In ActiveCampaign settings page scroll back up to the Site Tracking section of the page. Make sure to add your domain name to the ActiveCampaign settings page. ActiveCampaign site tracking will only work on domain names that have been whitelisted here. To find your Account ID, read through the big block of text that you can copy, until you find a big that says ?actid=92821912. Copy just the numbers (in this example it would be 92821912). Paste these details into the settings modal for the ActiveCampaign integration inside your BigPicture.io dashboard. Switch back to the "Details" tab of the modal to toggle the ActiveCampaign integration. 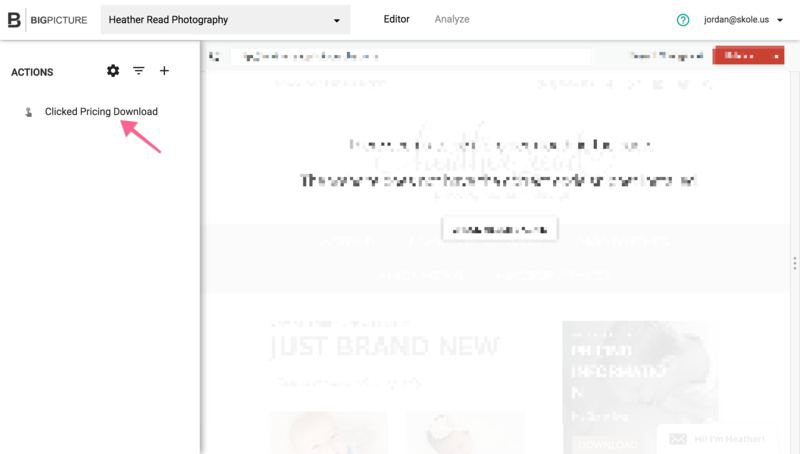 Click "Save" in the lower right to save your changes. You're all set to start sending events to ActiveCampaign! 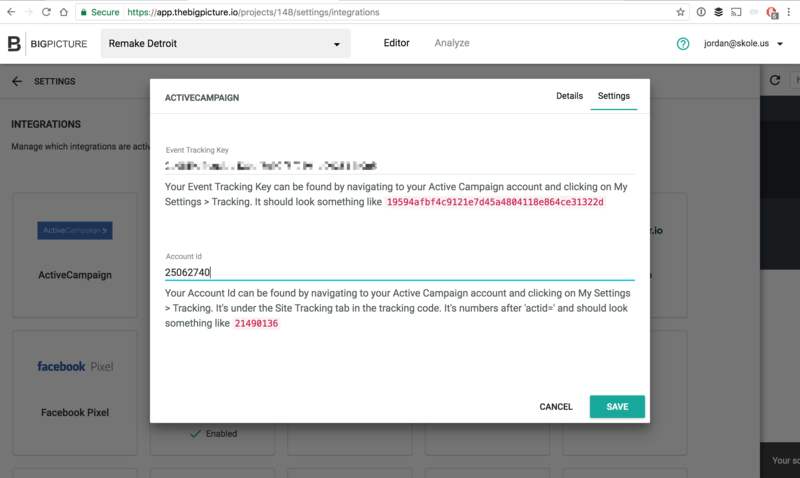 With BigPicture.io, you can send all of your tracked events to ActiveCampaign, or filter your events to only send a few. 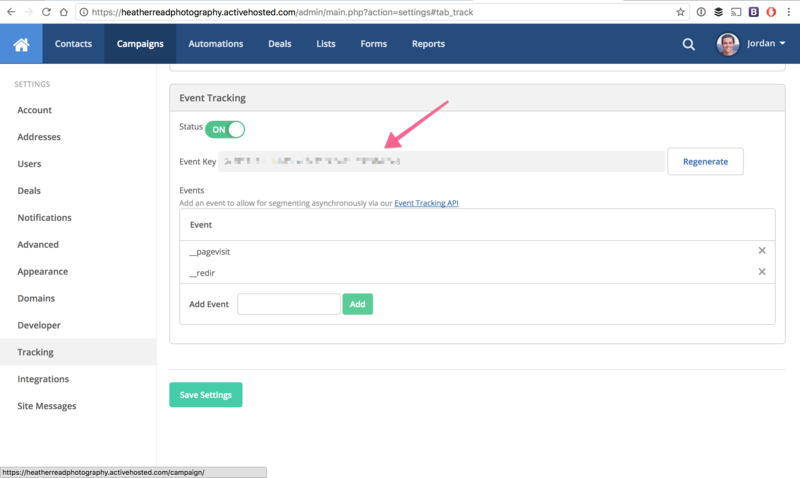 You can also customize the event properties that you send to ActiveCampaign whenever the event is triggered. BigPicture.io can pass static information as a property to ActiveCampaign, or you can dynamically populate property information using the BigPicture.io dashboard. From your dashboard, select the specific event you want to configure. From the event detail view, click on the gear icon, and then choose "Integrations" from the menu that follows. 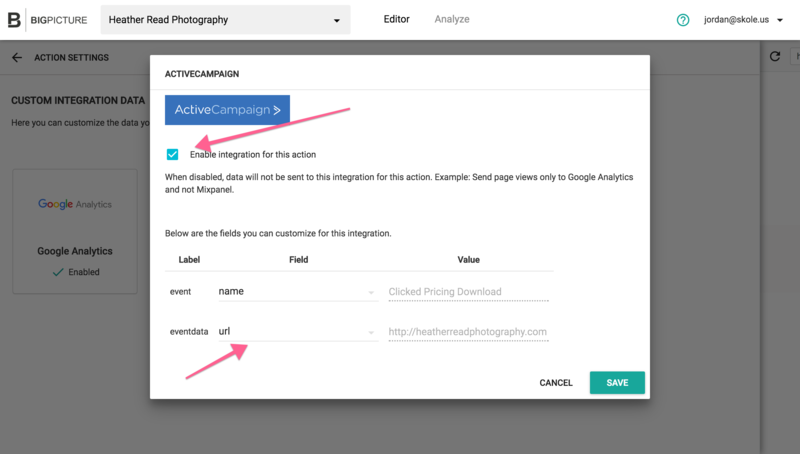 Select the ActiveCampaign integration. You can now toggle the event off if you would like to exclude this specific event from being sent to ActiveCampaign. You can also configure the event data that you would like to include when you send the event. ActiveCampaign will accept a single event property for each event. BigPicture.io will display an example parameter that will be included when the event is triggered using the "value" property.